Design, copywriting and marketing services available – YOU set the fee! How about this for an offer? Up until the end of March September 2010 I am offering up to 5 hours of design, writing and marketing time per person at whatever price you want it to be! Why am I doing this? Well, why not? There’s honestly no hidden agenda so what do you have to lose? Take a look at my About page profile and other blog entries – is there anything there that you feel you could tap into that would make life a little easier for you? Do you need a logo creating or a leaflet designed? What about some advertising or brochure copy? Maybe you need advice on social networking or someone to review your website who will see it with fresh eyes? In summary I am offering up to 5 hours of my time for a fee that YOU decide. You don’t even need to pay up front. What you pay will be the price that you think the work is worth. Come on, what do you have to lose? If you have such a task in mind or any questions please use my Contact Me page to get in touch – I’ll be happy to help in any way I can. I’ve become a bookworm these past few weeks reading a variety of books from educational, biographical to the downright silly. Normally I’m someone who takes one book, reads it, then gets another but not at the moment. Today I finished the second volume of the Michael Palin diaries 1980-1988: Half way to Hollywood which has taken me since to Christmas to complete. In between I’ve also be reading Outliers by Malcolm Gladwell, various books on money and finance plus the utterly bizarre Potty, Fartwell & Knob: Extraordinary but true names of British people by Russell Ash. I talked about Outliers in an earlier post but the Russell Ash book is one of those which I keep lying around to inject some humour if a day threatens to get too serious. I have an old book of newspaper and magazine misprints for just the same reason and I never tire of reading them. For many of us, being ‘good’ isn’t really good enough. We want to make the very best we can out of our lives – to achieve all we can achieve and be the best we can be. We want to be Brilliant. This book will give you tools to find out what point you are at now, understand where it is you want to get and develop strategies and powerful methods to get you there. As quickly as possible and as economically as possible with as much fun as possible. The book uses many clear examples and stories to show you how to overcome barriers that hold you back. You’ll learn how to develop a clear vision for a brilliant future and communicate with your friends, family and colleagues at a higher level. Would you rather be a good salesperson or a brilliant one? A good manager or a brilliant manager? A good friend or a brilliant one? Some areas of your work and life might need a bit of help – others you might think are pretty good. But even the good bits could almost certainly be better. It’s time to make the next step up and really shine. This book provides a complete practical guide to give you new levels of energy , enthusiasm and inspiration. You’ll be amazed what a difference it will make. 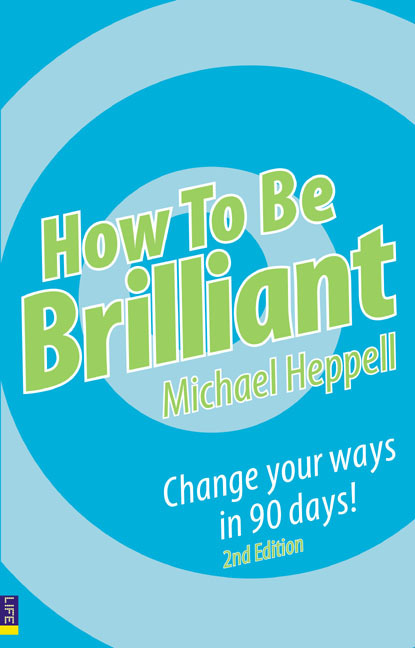 Ready to be brilliant? Just now I went and looked at Michael Heppell’s website and I see that there are many free resources available including bonus chapters, audio files and an interactive wheel of life. They really are worth a look. Here we are in the middle of January and I find myself being pulled around in all directions. The company I work for will be moving offices shortly but we still don’t know on what date which does make it tricky to plan anything. I can’t get fully into the design and layout for the new HotLINX because I’m caught up with a variety of PR work and event organisation and then we’ve still got the grim weather in the UK to deal with. Are these excuses? OF COURSE THEY ARE!!! But I’m fighting back! Today I started reading Outliers: The Story of Success by Malcom Gladwell on the bus into work. At least I’m using that so-called dead-time effectively and positively. This particular book looks at how certain circumstances in formative years play a lot bigger role in individual success than we might otherwise give credit for. It also says that it isn’t just natural talent that’s the key – it takes hard work and dedication and even mentions a figure of 10,000 hours ‘practice’ in 10 years to master a particular skill. Mozart has already been given a hard time because his early works as a six year old weren’t exactly compositions but arrangements of other people’s material. What is widely regarded as his first outstanding piece wasn’t written until he was in his early 20s. A little harsh on a child prodigy but I get his point. As is traditional with virtually every new BBC1 sitcom, Big Top has received a massive critical kicking, both in newspapers and on writers’ forums. I can never quite understand the snobbishness of aspiring comedy writers, who tend to unite in loathing any show which is popular with audiences. Two Pints and My Family spring immediately to mind. Personally I cannot comment on this particular show as I haven’t seen it but I found what he said and the way he said it particulalrly interesting. I understand what Michael Jacob is getting at and I agree with him to a point but I think there is far more to this story than there is at first glance. OrbellComms (OC) is here to provide a marketing and communications resource which interests and informs its readers. This why I include not only my own articles but material from other sites which I think should have a wider audience. On an earlier blog post I was asked in the comments section about permission to quote content on their own site. Personally I don’t have a problem with people doing that with copy that I have written myself just as long I’m given a name check and a back link to this blog but what if it isn’t mine? To be clear as to what is and isn’t OC written copy, look at the top and bottom of any blog post – if it lists a persons name or the title of a website this is material I have reproduced from elsewhere. I have given credit to the authors and/or websites in every instance and provide links back to the original material. It is very important that the people who have done the work do get that acknowledgement.